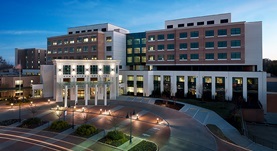 Dr. Sandifer graduated the medical school from the University of South Florida College of Medicine and did his residency at the University of Alabama Medical Center. A fellowship followed at Emory University soon after that. He is specialized in Pulmonology and board certified in Critical Care Medicine and Pulmonary Disease. Dr. Sandifer has been in practice for more than 11 years and is affiliated with Kennestone Hospital. During his career, he has also contributed to 2 publications of medical interest. Dr. Brett Sandifer has contributed to 2 publications. Potent effects of aerosol compared with intravenous treprostinil on the pulmonary circulation. Sandifer, B.L., Brigham, K.L., Lawrence, E.C., Mottola, D., Cuppels, C., Parker, R.E. ; J Appl Physiol. 2005 Dec. Effects of aerosol vs IV UT-15 on prostaglandin H2 analog-induced pulmonary hypertension in sheep. Sandifer, B.L., Brigham, K.L., Lawrence, E.C., Parker, R.E. ; Chest. 2005 Dec.